Osterman, Street have friendly joust at RBI Austin fundraiser. Banquet raises $663,000 to provide scholarships and mentorships for inner-city boys and girls. Osterman back on softball field, and not just as a Texas State coach. Street enjoying retirement after shoulder damage ended his baseball career. Cat Osterman had a few words of advice for fellow Texas Longhorn great Huston Street. Retirement, she said, is not all it’s cracked up to be. One legend to another, the softball icon told the baseball star as much in front of 900 people at a terrific RBI Austin banquet Thursday night that raised $663,000 to provide scholarships and mentorships for inner-city boys and girls. Their competitiveness was on full display. 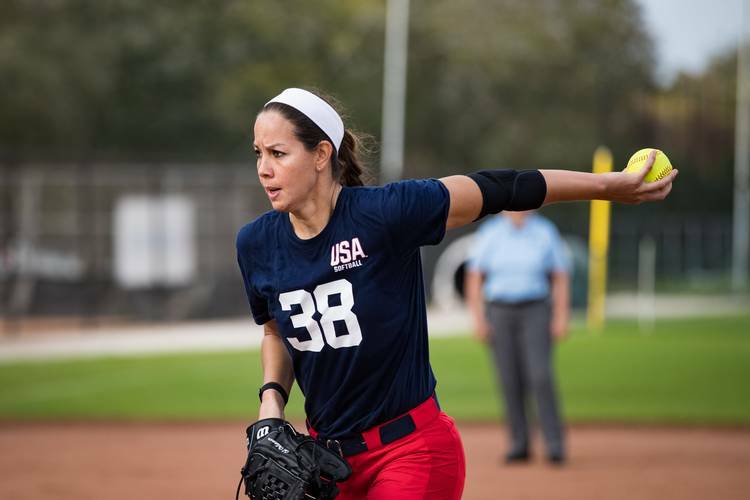 Still is for Osterman, who at 35 was selected this month to the U.S. national softball team, possibly a prelude to her return to the Olympic Games in 2020 after not playing in that event since 2008. That she did. The superstar wearing No 8 usually got the last pitch and, in this case, the last word. We all should have. Have there ever been two more competitive, more driven athletes to wow us on the Forty Acres than Osterman and Street? If they’re not at the top, it’s a very short roll call. While Street would dearly love to put on the No. 16 uniform once more and try to strike out Bryce Harper in the bottom of the ninth, his health prevents him. That and an abiding love for his life after retirement, especially with his wife and three kids under the age of 9. The heart won’t let Osterman stop, on the other hand. Not when her competitive fires still burn. Trying out for the national team was harder than she originally imagined. She hadn’t faced live hitters in more than three years. But her overpowering style all came back very quickly for the two-time Olympian and four-time All-American at Texas. And how would it not be? The softball pitcher who set the bar higher than anyone else does not deal well with failure. After five wins and two saves in two different Olympics, she suffered her only loss in the Summer Games, falling 3-1 to Japan. She didn’t come to grips for a long time with the loss that cost Team USA a gold medal and left it with a silver. Coincidentally, Japan will be the host country in 2020 when softball returns to the Games in Tokyo and so does Osterman, assuming all goes well in the Pan Am Games in Lima, Peru, this July and another tryout next fall. Did we mention that she’s competitive? Consider that during a 10-year span at the start of this century, Osterman posted a 59-4 pro record with a 0.38 earned-run average and 832 strikeouts in just 426 innings. She’s been one of the most dominant pitchers of her generation. On an even larger scale, Osterman is hopeful that softball — as well as baseball — can be restored permanently to the Olympics after what will be a 12-year absence. She wants it as much for the Olympic movement as she does for all those girls who have come after her and been deprived of their dreams of gold. In the meantime, she’ll juggle her duties at Texas State with her conditioning and work with Team USA as she prepares for her second act. Osterman has the blessings and support of her Texas State family, and Street will support her from the sidelines, although he couldn’t resist answering one final question about closure. And closing.